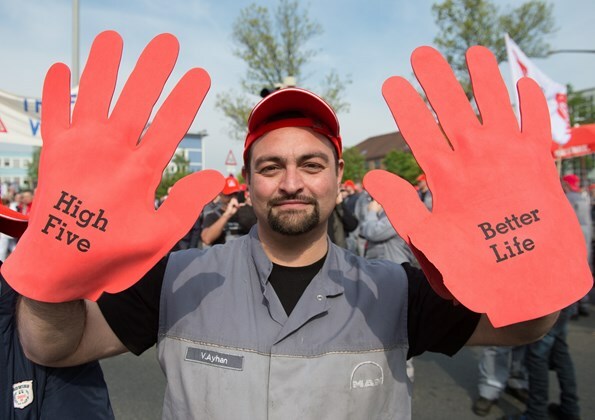 On 5th February the giant German metal and engineering workers union IG Metall reached a ‘ground-breaking’ national sectoral pay and conditions agreement with engineering employers in the region of Baden-Württemberg. The agreement will apply across Germany – eventually covering 3.9 million workers. Under the German system of sectoral collective bargainng, negotiations begin in one region (Baden-Württemberg is one of the manufacturing heartlands of Germany with companies such as Daimler, Volkswagen’s Porsche and auto parts firm Bosch) and if no progress is made, unions stages ‘warning strikes’. Strikes did take place at of high profile companies in the region including Daimler, Siemens and Airbus this year after the employers organisation Suedwestmetall, offered only a 2% pay increase. The deal is seen as testament to the growing influence of German unions against a backdrop of the country’s strong economic performance and low unemployment. The series of warning strikes cost carmakers, automotive suppliers and engineering firms almost 200 million euros ($249 million) in lost revenues, affecting big firms like Daimler, BMW and Airbus and dozens of smaller suppliers in the German ‘Mittlestand’, privately owned SME’s in the supply chain. A 4.3% plus increase from 01.04.2018, a €100 lump-sum for the months January to March 2018 (apprentices will receive €70), and a collectively agreed supplement of 27.5% of a monthly salary and a fixed amount of €400 from 2019. The right to a limited reduction in working hours up to 28 hours for up to 24 months. Additional days off for parenting and nursing as well as relief for shift work. German industrial relations experts say the deal reflected a “new mindset among younger workers”. “More and more people have periods in their lives when they want to work less, for example to look after elderly relatives, or to take a sabbatical or unpaid leave,” said Hanna Schwander, professor of public policy at the Hertie School of Governance in Berlin. The days when employees joined a company at an early age, worked full time most of their lives and retired early were “long gone” – and it was becoming “increasingly important for people to reconcile their personal and professional lives”, she said. “The wage settlement is a milestone on the path to a modern, self-determined world of work,” said Jörg Hofmann, IG Metall’s chairman. Germany’s collective bargaining talks have been watched closely by the European Central Bank, which would be better able to hit its inflation target if wages in the Eurozone’s largest economy rose. Mario Draghi, the ECB chief, has said wages need to grow before the bank can unwind its crisis-era stimulus measures. But Mr Hofmann said the deal would have a “positive effect” across the economy, with the “significant increase in incomes strengthening domestic demand”. Besides the pay settlement the groundbreaking deal includes the right of workers to reduce the working week from a standard 35 hours to 28 hours for two years, to care for relatives and dependents. Workers would switch from the present 35 hour week to 28 hours per week for up to two years before a return to full-time work. Until now, those switching temporarily to shorter hours have enjoyed no guarantee they could reclaim their full-time post. Their salary will be adjusted to fall in line with shorter number of hours, but some beneficiaries such as young parents, those caring for elderly relatives or people doing shift work, will be able to take more paid holidays. “Workers’ priorities have shifted. Instead of higher wages, work-life balance is now in focus,” BayernLB economist Christiane von Berg said. Commenting on the deal (which has been sent to all manufacturing unions in Europe) Luc Triangle, General Secretary of industriAll Europe, the European wide manufacturing union federation said: “It is only fair that the German metalworkers get a good share of the wealth they have contributed to create. This is good for the economy as a whole since this pay rise will translate into more purchasing power. This is also a signal for all European workers for whom it is high time for a wage increase”. “After years of flexibility imposed by employers, this agreement is shifting the balance of power in introducing more self-determination for workers in their working time. This agreement is at the cutting edge of modern working time with more possibilities for workers to have working arrangements that fits their life and their health. This entry was posted in International Trade Unions, Media, Trade Unions. Bookmark the permalink.